OlliOlli 2 is one of the most satisfying games I've played in a long time, with the way it feels, flows and moves combining with the immediate feedback and constant drive to push you through. Start an ollie into a grind, complete a manual, down a slope, perfect launch, keep it going, reach the end. Level long combo. High score. Completed objectives. Next level. Ollie into NO DON'T PRESS A, STUPID HANDS! Crash. OlliOlli 2 is also one of the most frustrating games I've ever played for that exact reason. The game immediately gets me into a state of oh-so-ecstatic endorphin-releasing flow and I ride so high on it. The pulsing of the music on the excellent soundtrack and the sounds of the board as I hit the tricks just brings me in. One of those games where I forget to blink. And then when I'm brought down from that it's a huge shift and it's frustrating and I'm just more upset with myself than I've ever been with almost anything else. I groan in frustration, cursing myself, my controller, my damn human hands, even as I hit retry and start again. All of which is to say that OlliOlli 2 is superbly designed. The original game was already great, but we're talking Tony Hawk 1 to Tony Hawk 2 levels of improvement here. The original, for its excellent work and the amount of excitement it generated, was good. OlliOlli 2 evolves it, adds more modes, more tricks, more reward and a greater ability to just chain everything together. And for the exact same reason as Tony Hawk 2: manuals. You can now combo an entire level together through a series of tricks, something the game often challenges you to do, something that just grows more challenging and more rewarding as time goes by. Whatever you feel about endless runners, it's important to consider what's good about these games. OlliOlli isn't an endless runner, but it's a game of a similar breed. Perhaps something more akin to Guitar Hero is more your speed? They all tap into one thing: the thrill of execution, of knowing your hands on the controller are getting you through this challenge, getting better the further you go. It's what makes events like EVO, AGDQ, or The International so fun to watch: games being executed excellently. Watching someone know how to use a controller and make the game perform exactly how they want. You and I? We're not speedrunners. We're not world class players who are on their way to winning jackpot sums of money. But I feel like OlliOlli and games like this are the closest average gamers like you and I are going to get to knowing that sublime feeling those people get on the world stage. I don't have the skills to beat Duke Nukem 3D in 25 minutes. But I can get through the latter levels of OlliOlli 2 without breaking my combo AND putting in a revert manual and grind switch, and that feels excellent to me. 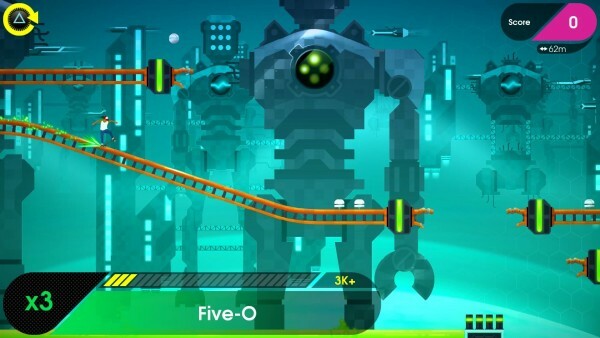 Your main goals in each level are to a) complete it and b) finish the 5 objectives, and this is where OlliOlli 2 starts to run into the same issue that plagued the original: our hands can only do so much, and so can the sensitivity of an analog stick. At some point, asking for specific tricks with hyper precise inputs just winds up blocking progress, the difficulty of those inputs gate your progress. You don't know what to be more upset about: the controller not reading what you think you're putting in, yourself for not putting it in right, or the game for even asking for something so precise. It's a lot to ask that I'm able to put in a correct half- or full-circle motion and get this trick down, and it's even worse when it asks you to put it into a full-level combo. In the end with challenges like this you feel more like you get it by luck than by skill. However, I do also appreciate the game's switching from just a generic background to taking you through a bunch of movie sets. It doesn’t make a difference to the gameplay – you still grind and flip and all that – but it brings a nice change of venue. Does it make sense you're skating through an Aztec temple? No. But does it have to? After five years, a wealth of console ports, and a 2015 sequel, OlliOlli is back, and it's bringing its zany, high-octane action to the Nintendo Switch in the form of OlliOlli: Switch Stance. Aside from its wonderfully punny title, Switch Stance – published by Gambitious – bundles both OlliOlli and OlliOlli2: Welcome to Olliwood into one convenient, consumer-friendly package. OlliOlli 2: Welcome to Olliwood was a great surprise for me. It has the nice touch of being difficult but not absurdly hard. It gives you the tools and skills to be the sickest skateboarder you never were. The best real world comparison would be those little skateboards you could buy for your hands. You can go big and all out for the greatest trick ever, without the worry of ending up in the hospital. OlliOlli ultimately provided me a solid five hours of fun and frustration in equal measure.